Ambassador Dana Shell Smith, official photo/Twitter avatar. Increasingly difficult to wake up overseas to news from home, knowing I will spend today explaining our democracy and institutions. Shell Smith has not commented on Twitter since. Shell Smith, a career foreign service officer, was appointed in 2014 by President Barack Obama and confirmed by the Senate. FEC records show that Shell Smith donated a total of $1,000 to the presidential campaign of Hillary Clinton over a ten month period from December 10, 2015 to September 26, 2016. The first two contributions were for $250 each with the next four at $100 with the final two at $50. Shell Smith is listed in the FEC donor disclosure forms as being a Foreign Service Officer employed by the State Department. Shell Smith’s donations to Clinton were first reported by Chuck Ross with the Daily Caller. Dana Shell Smith was confirmed by the Senate as the U.S. Ambassador to Qatar on July 10, 2014. 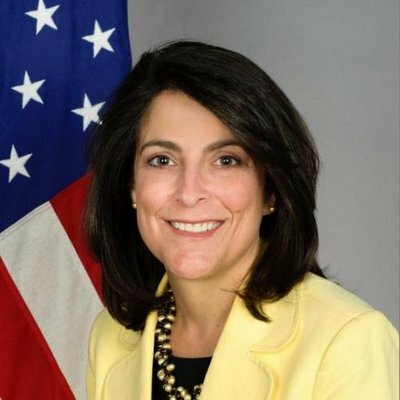 Previously, she served as Principal Deputy Assistant Secretary of Public Affairs from 2011 to 2014 and as Deputy Assistant Secretary for International Media. Prior to her assignments in the Bureau of Public Affairs, Ambassador Smith was the Department’s Regional Arabic Language Spokesperson in Dubai. She served in a number of positions including as Senior Advisor to the Director General and overseas tours of duty in Taipei, Amman, Tel Aviv/Gaza, and Cairo. As a career Foreign Service Officer Shell Smith was not affected by then President-Elect Trump’s edict firing all of Obama’s politically appointed ambassadors effective January 20. There has been no apparent comment by the State Department as of the publication of this report.